Luarca-Shoaf describes the map, an invention of St. Louis entrepreneurs Myron Coloney and Sidney B. Fairchild, in more detail in an article of her own at Common-Place. "The completely unfurled map extends beyond the limits of the user’s reach, wondrously embodying the scope of the river in the time it took to unroll it and in the eleven feet of space it now occupies," she writes. "At the same time, the care required to wind the strip back into Coloney and Fairchild’s patented spool apparatus reiterates the precariousness of human control — either representational or environmental — over the mercurial Mississippi." We still today talk about "scrolling" maps, though we now mean it as nothing more than a digital metaphor. 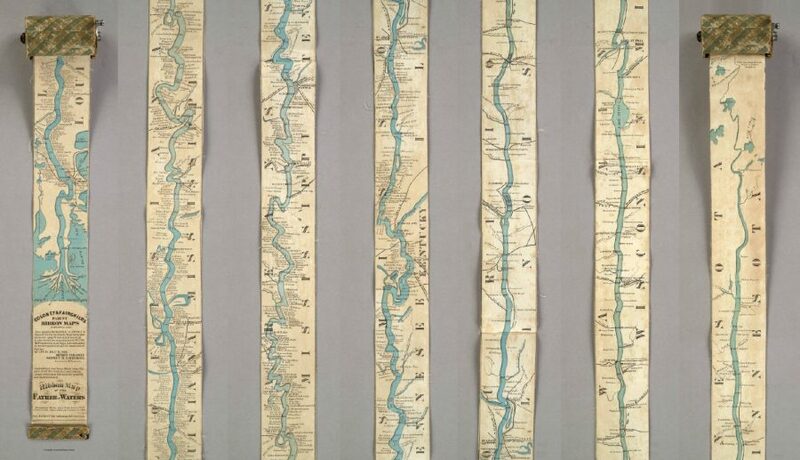 Unwieldy though it may seem, the Ribbon Map of the Father of Waters must have struck its travel-minded buyers in the 1860s — some 150 years before technology put touchscreens in all of our hands — as the height of cartographic convenience. Despite having sold out their Mississippi River map quickly enough to necessitate a second edition, though, Coloney and Fairchild did little more with their patented concept. You can see a surviving example of the Ribbon Map in greater detail at the Library of Congress and the David Rumsey Map Collection. The current generation of river tourists yearning for an understanding of the surprising breadth of America's land and depth of its history may even constitute sufficient market for a replica. But what happens when it gets wet?